Suzanne is an award-winning non-profit leader and public speaker, with a long career dedicated to helping people and causes across a variety of media and platforms. Most recently based in Kenya, Africa, Suzanne is a volunteer Strategic Planner at the Hawker’s Market Girls Center (HMGC), a school for girls from the slums of Nairobi. HMGC serves girls and young women hardest hit by the devastation found in the some of the poorest communities in the world. For them, every day is a struggle, from sexual violence to lack of clean water, sanitation and personal safety. 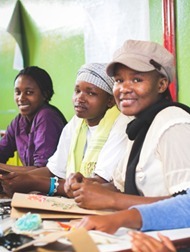 Girls come to the center to learn life skills and vocational training in order to rise out of their circumstances and find a secure and meaningful future. Before moving to Kenya, Suzanne was co-founder and former President of Games for Change (G4C), a non-profit which supports new kinds of video games for humanitarian and educational purposes. Suzanne led Games for Change for six years, becoming the catalyzer and primary voice for a new movement. She has been featured as an expert in national and international press and has given talks around the world, such as at Sundance, Global Contents Forum Seoul, SXSW, PopTech, TEDx, and Harvard Human Rights. Suzanne has also served as an advisor, juror, and invited expert on a variety of social impact projects including the Microsoft’s Imagine Cup, Scholastic Art and Writing Awards, the Knight Foundation’s News Game Awards, National STEM Video Game Challenge, and Boston Children’s Hospital Generation Cures. She is also the co-founder of PETLab (Prototyping, Evaluating, Teaching, Learning), a public interest design and research lab for interactive media at the New School, launched with the support of mTV and the MacArthur Foundation. Before G4C, Suzanne worked for many years with Marc Weiss during the founding of Web Lab, a socially-conscious think tank dedicated to using the internet for social good during the early days of the world wide web. In her 30s, Suzanne worked in documentary film, including as Production Manager on the Stephen Ives/ Ken Burns’ PBS Series, “The West.” After the fall of communism, Suzanne co-produced the first humanitarian aid/ television event in Czechoslovakia bringing medical supplies to hospitals around the country with a focus on neonatal intensive care. Just out of college, she conceived and produced one of the most successful volunteer Amnesty International benefit events, “The Art of Free Expression,” a photography exhibition raising money to help free people overseas unjustly imprisoned for their beliefs and ethnicities. Suzanne has been a proud volunteer for Housing Works, a charity supporting homeless people living with AIDs, and Visiting Neighbors, a non-profit dedicated to helping the elderly in New York City remain active and independent by providing assistance such as escorts for errands and doctors’ appointments. Suzanne is a competitive Scrabble player but most enjoys playing it with her daughter.